Have you ever launched an Inbound marketing plan that you thought was perfect but then it backfired? Maybe you generated a ton of leads with quality content, but when you passed them to sales, no one converted. Maybe your marketing WAS successful, but you didn’t have the right metrics in place to demonstrate your success to the powers that be. Overemphasis on website design at the expense of the overall marketing plan - Most B2Bs expect the website to generate leads because it looks good, communicates, can be found in search engines and communicates the company’s value proposition. Company websites, though rich in product descriptions, are often little more than digital brochures that fail to provide sales qualified lead generation (SQLs). Lack of an Effective Underlying Digital Marketing Strategy - Conducting digital marketing in an incremental, non-holistic way is very inefficient because it creates a lot of redundancies in the effort that is involved to setup each strategy and it also makes things harder to manage and measure on an ongoing basis. Lack of Insight Into Your Buyers and Their Process - You know the saying garbage in garbage out? Well, that’s what you have if you’re basing your marketing decisions on inaccurate assumptions about your customers. Lack of a Reporting Structure That Closes the Loop Between Marketing and Revenue - Your overall strategy must include a plan to accurately and efficiently track ALL of your campaigns from entry and conversion, through to SQL and sales revenue. Pulling if off requires planning and a wide range of skills. Sending Unqualified Leads to Sales, Wasting Their Time - The combination of poor strategy, poor buyer insight, and poor measurement ultimately leads to horrible results with lead generation. When marketing provides poor quality leads, the relationship between sales and marketing is strained, almost to the point of complete distrust. Not Taking Advantage of Marketing Automation Tools - More than half of B2B companies (55%) have already adopted marketing automation. Yet, here’s the big problem and another opportunity: Only 21% believe they are using it effectively and only 3% can say they have achieved Marketing Automation nirvana. Inability to Produce Remarkable Content Consistently - Most B2B marketers understand the importance of creating engaging content but many struggle to succeed at producing it. Why? There are three key factors that contribute to this problem. We already talked about the first two: buyer insight and measurement. The third is lack of an efficient content production operation. How many of these resonated with you? Whether it’s one of them or all of them, you know something has to change, right? The BIG problem is that Inbound marketing can become unwieldy without a solid strategy. 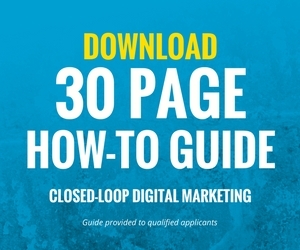 In my next post, How Digital Marketing Works and What is Closed-Loop Digital Marketing, I will show you where marketing professionals fail in their digital marketing approach and how an innovative account based closed-loop methodology solves those problems and generates results.